This is not the typical GVP/QuikPak 4060 sold to consumers. 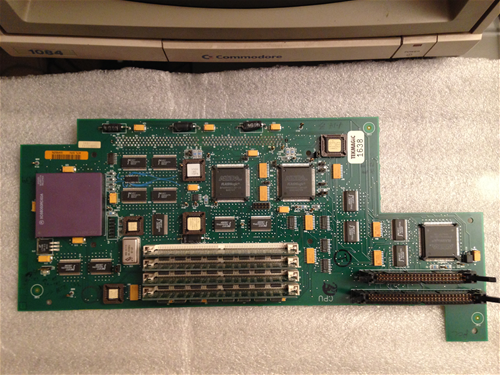 It is a special board sold for a medical ultrasound system that used an Amiga 4000T as the central processor for the machine. 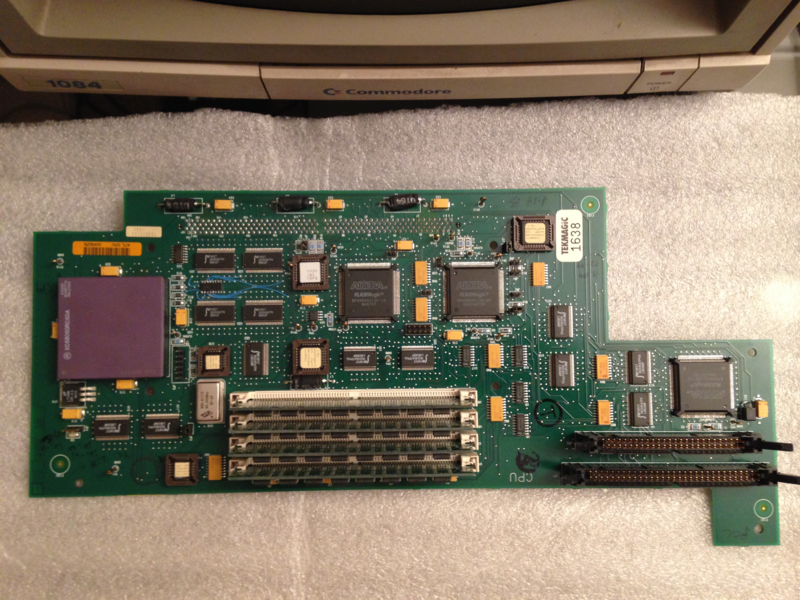 It is a 68060/64MB/60Mhz CPU board that will only fit in an A4000T (possibly an A3000T, but none available currently to form-factor test). It can not fit in a desktop A3000/4000D due to the shape/length. The custom connectors are for ultrasound-specific hardware that was integrated in the provided system (presumably a connection to special video or control hardware). 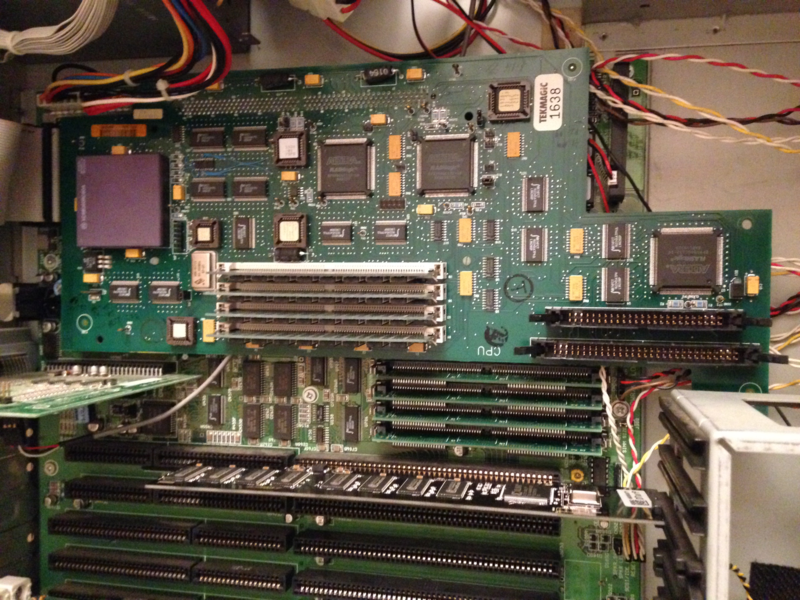 A4000T motherboard CPU jumpers get set to Int clocking. Board supports 64MB with only 4x standard 16MB SIMMs (4x 32MB modules or 128MB not supported). No RAM is configured if <4 SIMMs present. The board's RAM is placed at 08000000-0BFFFFF, Memory Priority 40 in memory list. Typical CPU board expansion RAM. This board places an $00F00000 address space board/ROM (cartridge?) into the system. Research has identified that this contains the small amount of code necessary at boot time to address the 68060 FPU that Kickstart does not have natively. 3rd party links above designate that KS3.1 default in A4000T is supported with the F0 cartridge/diag code present. Tested with official Cloanto Amiga Forever 3.x (3.9) ROMs (KS 45.64), using WB 3.1 at the moment. It said (but not confirmed) that 50ns RAM can be used with overclocking to about 66Mhz. I have added 50ns RAM, but no opportunity yet to de-solder the oscillator and test. From power on to Workbench, with an IDE DOM, WB 40.42, is less than 10 seconds (first HD blip to WB). Sysinfo reports 2.6MB/sec off the IDE DOM module I have. No devices on the SCSI interface. BigRAM 256MB card installed, Hydra Systems AmigaNet card in a slot. 16MB DRAM motherboard FastRAM. Motherboard ROM set for 160ns reads (fastest). Gotek floppy. Page contributors: Robert Maruszakm, Robert Miranda (GVP Tech Support).